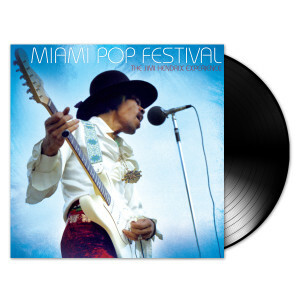 Never previously available in any form, Miami Pop Festival, introduces the first recorded stage performances of "Hear My Train A Comin'" and "Tax Free" while showcasing definitive live takes on such classics as "Fire," "Hey Joe," "I Don't Live Today" and "Purple Haze." The package includes never before published photos taken at the festival and an essay by award-winning music journalist and Grammy Museum Executive Director Bob Santelli. This album includes the show as originally recorded on site by Hendrix's long term sound engineer, Eddie Kramer. This pressing is an all analogue mastering by Bernie Grundman.